Silva struggles day after day after her husband's sudden death and struggles to find her spot in a world that is so different from the twenty first century that she comes from. Then when she arrives at her new home she sets eyes on a man that she was absolutely sure she would never see again. A man that could possible heal the heart that she was absolutely certain that would never heal again. 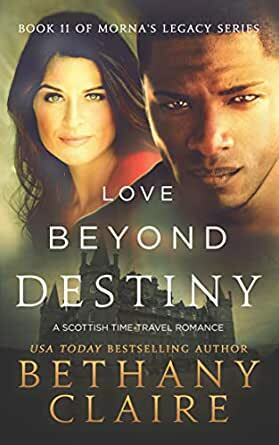 Every day Marcus remembers the mysterious woman he met at his best friend's wedding and it certainly never once occurred to him that that she would end up as a resident of the same castle he lives in which is called the Isle of the eight. Having her so near him day in and day out is both a blessing and a curse all at the same time. He knows that only time can heal her broken and grieving heart and he has decided to wait as long as it takes, for one day he is absolutely positive that she will love him as well. But his love for him just may not be enough, for there is another bigger secret on the horizon that could tear her away from him forever and there is nothing he can do about it as Silva has to forge her own path in life. Will Silva be able to move on from her past grief and heartache, or will her life be turned upside down once again? They don't call Bethany Claire the Queen of time travel for nothing. Once again she has managed to blow my mind and render me utter speechless. Ms. Claire has a talent for time travel that so many try, but never can keep my whole attention throughout the whole book and keep me thinking of it long after the book is all read. Kudos to Ms. Claire it seems that you have yourself another winner. It seemed like we waited for this new book to be released FOREVER! In reality, it was probably a year-ish. I know that I had enough time to start back at Book 1 and read my way all the way to this one. And luckily, when I got to the last one (the previous to this one book) this one released about a week later. So I was beyond ready!! I started reading the day it came out...and sadly was finished just a couple nights later. They just never seem to last long enough for me! It was a good story. There was a lot of details in the beginning and middle areas. But toward the end when Machara was being defeated there were no details at all. Then it was finished. I wanted more meat at the end of the book for sure. But I still gave it 5 stars because I love her stories and I love being transported through time with her stories. I will read them over and over and enjoy them from now on...and will sit on pins and needles wondering and waiting on the next piece to the giant Morna's Series! Bethany Claire has done a n amazing job of bringing together this series of diverse time travel, witches, historical,contemporary and even the ghost story with Castle Dune in the to fruition. I have just finished rereading the series straight through and that's a wonderful way to go. Moran full-speed. Bethany has such amazing plot control and keeping track of who is where. The integrated family members, as they are related from story to story is so much fun to see reading this way. And the pass off from Morna and Kerry's story to The Eight Lakers is so smooth with the picture painted in her description of her first roommate travel adventure told of there. The second phase of Mornas Legacy really comes to life on the Isle of Whispers where we find out that knot only has Morna. Been taking care of the men in her family who love strong modern women, she's been preparing for some major female mojo to take down a beast of a farie that's been terrorizing the men in her personal extended"family" according to the term "family at my house anyway. Those closest to you are family family blood or no when especially when they stand I'm the line of Fire for you. (See Morna and Kerry's story) Thus, Mornas girl's all come together ion this Book 11 to kick some major ads and take names. Hopefully, we"'ll get lucky and Morna will either start the next chapter of her meddling ways or maybe Cooper will begin to show some signs of wizardry of his own and she will be his mentor. Now wouldn't that just be another kind of wonderful??? This is not a suspense book, however, how the author guided us to the end was certainly suspenseful in a good way. Love Beyond Destiny defines what real love is as opposed to selfish love. Marcus and Silva take an amazing journey. Don’t miss this book, this series. Silva and Marcus are a great story about patience and love, respect for each other and a sweet love that is meant to be. Although we had to wait extra time for this book it was well worth it! I devoted this one in a couple hours so now I sit and wait for another.